Wattle and daub is a composite building material used for making walls, in which a woven lattice of wooden strips called wattle is daubed with a sticky material usually made of some combination of wet soil, clay, sand, animal dung and straw. Wattle and daub has been used for at least 6,000 years and is still an important construction material in many parts of the world. Many historic buildings include wattle and daub construction, and the technique is becoming popular again in more developed areas as a low-impact sustainable building technique. The wattle is made by weaving thin branches (either whole, or more usually split) or slats between upright stakes. 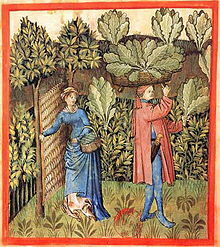 The wattle may be made as loose panels, slotted between timber framing to make infill panels, or made in place to form the whole of a wall. In different regions, the material of wattle can be different. For example, in Mitchell Site on the northern outskirts of the city of Mitchell, South Dakota, willow has been found as the wattle material of the walls of the house. Reeds and vines can also be used as wattle material. The origin of the term wattle describing a group of acacias in Australia, is derived from the common use of acacias as wattle in early Australian European settlements. The wattle and daub technique was used already in the Neolithic period. It was common for houses of a Linear pottery and Rössen cultures of Central Europe, but is also found in Western Asia (Çatalhöyük, Shillourokambos) as well as in North America (Mississippian culture) and South America (Brazil). In Africa it is common in the architecture of traditional houses such as those of the Ashanti people. Its usage dates back at least 6000 years. There are suggestions that construction techniques such as lath and plaster and even cob may have evolved from wattle and daub. Fragments from prehistoric wattle and daub buildings have been found in Africa, Europe, Mesoamerica and North America. A review of English architecture especially reveals that the sophistication of this craft is dependent on the various styles of timber frame housing. Close-studding panels create a much more narrow space between the timbers: anywhere from 7 to 16 inches (18 to 40 cm). For this style of panel, weaving is too difficult, so the wattles run horizontally and are known as ledgers. The ledgers are sprung into each upright timber (stud) through a system of augered holes on one side and short chiseled grooves along the other. The holes (along with holes of square paneling) are drilled at a slight angle towards the outer face of each stud. This allows room for upright hazels to be tied to ledgers from the inside of the building. The horizontal ledgers are placed every two to three feet (0.6 to 0.9 metres) with whole hazel rods positioned upright top to bottom and lashed to the ledgers. These hazel rods are generally tied a finger widths apart with 6–8 rods each with a 16-inch (40 cm) width. Gaps allow key[clarification needed] formation for drying. In the early days of the colonisation of South Australia, in areas where substantial timber was unavailable, pioneers' cottages and other small buildings were frequently constructed with light vertical timbers, which may have been "native pine" (Callitris or Casuarina spp. ), driven into the ground, the gaps being stopped with pug (kneaded clay and grass mixture). Another term for this construction is palisade and pug. "Mud and stud" is a similar process to wattle and daub, with a simple frame consisting only of upright studs joined by cross rails at the tops and bottoms. Thin staves of ash were attached, then daubed with a mixture of mud, straw, hair and dung. The style of building was once common in Lincolnshire. 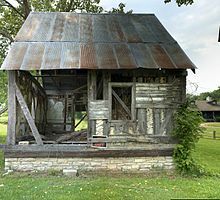 Pierrotage is the infilling material used in French Vernacular architecture of the Southern United States to infill between half-timbering with diagonal braces, which is similar with daub. It is usually made of lime mortar clay mixed with small stones. It is also called bousillage or bouzillage, especially in French Vernacular architecture of Louisiana of the early 1700s. The materials of bousillage are Spanish moss or clay and grass. Bousillage also refers to the type of brick molded with the same materials and used as infilling between posts. Columbage refers to the timber-framed construction with diagonal bracing of the framework. Pierratage or bousillage is the material filled into the structural timbers. Example of pierrotage construction in Ste. Geneviève, Missouri. Bajarreque is a wall constructed with the technique of wattle and daub. The wattle here is made of bagasse, and the daub is the mix of clay and straw. Jacal can refer to a type of crude house whose wall is built with wattle and daub in southwestern America. Closely spaced upright sticks or poles driven into the ground with small branches (wattle) interwoven between them make the structural frame of the wall. Mud or an adobe clay (daub) is covered outside. To provide additional weather protection, the wall is usually plastered. ^ Allen, Edward, & Iano, Joseph. "Fundamentals of building construction: materials & methods, fifth edition"
^ "Australia's Wattle Day – Parliament of Australia". Aph.gov.au. Retrieved 2016-10-24. ^ Alex 1973, p. 151. ^ Shaffer, Gary D. (Spring 1993). "An Archaeomagnetic Study of a Wattle and Daub Building Collapse". Journal of Field Archaeology. 20 (1): 59–75. JSTOR 530354. ^ Aslet, Clive (15 August 2011). "Villages of Britain: The Five Hundred Villages that Made the Countryside". Bloomsbury Publishing USA. Retrieved 20 March 2018 – via Google Books. Robert, Alex (1973). "Architectural features of houses at the Mitchell Site (39DV2), Eastern South Dakota". Plains Anthropologist. 18 (60). JSTOR 25667144.